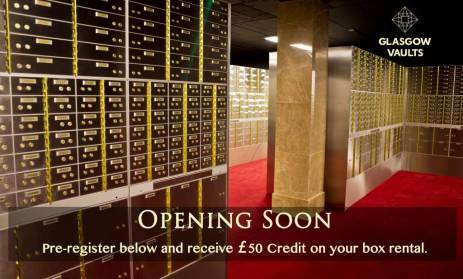 Reserve Your Safe Deposit Box Below from less than £3 per week. Many Major Banks are no longer offering a ‘safe deposit box’ service to their customers, yet now more than ever companies and individuals need to secure valued possession safely. According to Scottish Crime & Justice Survey 2013 – Property crime accounts for 71% of crime with home burglary on the rise. Owners can be forced to open home safes under threat of physical violence. Situated only minutes from Glasgow Central, we offer unparalleled convenience for our clients. Glasgow Vaults is accessible via several transport links. Car parking is readily available outside our facility for your convenience and private secure parking is available on request.